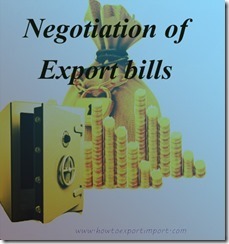 what is negotiation of export bills? How does Negotiation of export documents work? Who negotiate of export bills? How to negotiate export documents with bank? What are the procedures and formalities to negotiate export bills? Once your goods moved out of your factory, the Customs House Agents appointed by you complete customs formalities on behalf of you and delivers you necessary export shipping documents. Once customs formalities completed and obtained ‘let export order’ shipping bill, you hand over cargo to shipping line to carry your goods to final destination at buyer’s place. Once after handing over cargo to shipping line, Bill of Lading is issued. What are the precautions to be taken while submitting documents for negotiation with bank? While negotiating documents, you submit all required documents as per letter of credit terms and conditions to bank to send to your overseas buyer though LC opening bank. When shipment is under Letter of Credit, documentation is a crucial part as the opening bank debits you against any discrepancy found on documents. So once you received Letter of Credit, make a copy of the same and read carefully twice. Mark each and every point where ever necessary. Whether any international inspection required, clean on board bill of lading, factory inspection certificate, certificate of origin, legalized documents, consulate attestation, SGS,BVQI inspection, Phyto sanitary certificate, chemical analysis certificate, shipped on board certificate, freight certificate, etc.etc. List out the documents required to submit while negotiating bills. Go through each document minimum twice, whether each document is as per LC requirements. Make sure, all documents are there as per LC terms and not found any discrepancy in each of document. This is very important while submitting documents with bank to send to overseas buyer through buyer’s bank. Once after receipt of export documents, your bank arranges to negotiate bill as per Letter of credit terms and conditions after proper verification of each and every clause. If your export order is in US Dollar currency, you can either convert the amount in your currency or you can open a dollar account and transfer the amount accordingly. 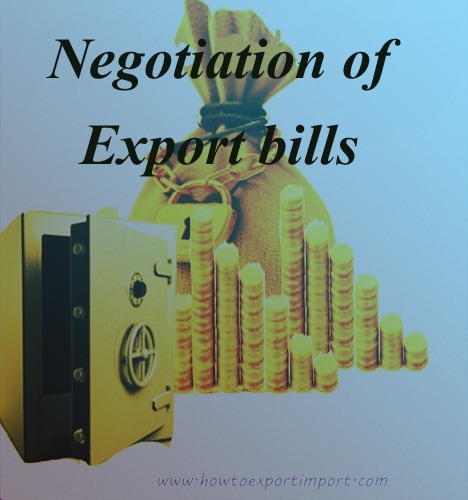 Have you satisfied with this article about negotiation of export bills by bank with necessary precautions, formalities etc.? Would you like to add more information about negotiation of export bills, precautions to be taken by exporter on negotiation of export documents or procedures and formalities under negotiation of export documents? Share below your experience in handling negotiation of export documents with procedures and formalities under negotiation of export bills under LC. Your comments below about this article - Negotiation procedures and formalities of export bills. FRANK MANOHARAN: On 06 April 2015 RBI INSTRUCTIONS TO NEGOTIATING BANK ON ACCEPTANCE DOCUMENTS - IF SHIPPING BILL AND INVOICE VALUE VARIES. In one of our export case the CHA had filled the Shipping bill per unit rate 10 dollars more than the accepted price from the customer. While invoicing the rate per unit was billed Usd 10/- lesser than the Shipping bill filled rate. While negotiation of the document the banker refused to accept the document and requesting us the amend the shipping bill value to at par with the Invoice value without knowing the procedure involved in amendment of shipping bill (Almost impossible to amend the Shipping Bill). Hope the Shipping bill value should not be declared less than the Invoice value as it effect the inflow of the Foreign currency and claims of various incentives. Where as in our case, we declared higher value and invoice lesser than the declared shipping bill. Most of the banks are accepting the if we declare the value higher in shipping bill and claim by invoice is lesser. What is the correct guidelines by rbi to the negotiating banks?. Mohit: On 13 May 2015 Hey Thanks for providing such amazing site.It help me a lot for understanding export-import.